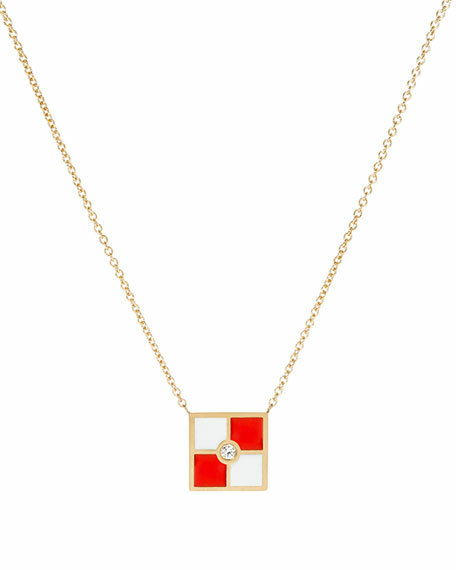 Maritime flag signal for the letter U.
JudeFrances Jewelry necklace from the Moroccan Collection. 18-karat yellow gold with signature brushed JFJ finish on a dancing diamond chain. JudeFrances Jewelry necklace from the Moroccan Collection. 18-karat yellow gold with signature brushed JFJ finish on a dancing diamond chain. Two white diamond pendants; quad and marquise drops. 0.08 total diamond carat weight. Approx. 18"L. Imported.